We are very pleased to be hosting a special adoption information session on Thursday 9 May, from 6-8pm (see event page for details). If adoption is something you have been thinking about, the event will be a great opportunity to find out what you need to know. You will be able to find out about the process; the children who need adoptive families, hear from people who have already adopted, and get any questions you have answered. Refreshments will be provided. Please see contact details at the bottom of the page. The fostering team will be holding a special roadshow in April. They will have a stand in Ealing Broadway shopping centre on 18th, 19th and 20th April from 9am-7pm. The team will be talking to people about fostering, answering questions and handing out free bags and information. Why not go along and meet them there. 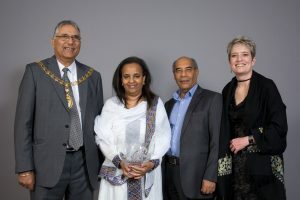 Tsigehana Asefeha and Eyob Tesfazghi, a couple who have been fostering for Ealing since 2012, have been named Ealing Council’s Foster Carers of the Year, at the annual foster carers’ awards ceremony. They have looked after several children and were recognised for their exceptional care of a particular young person. Adoption Week took place 15-21 October 2018. The annual event was organised by First4Adoption, a national adoption information service. This year the focus was on adopters themselves. The event was to increase awareness of adoption and to highlight the children who are currently waiting to be adopted. If you would like to know more, please get in touch with us.